When Visual Studio 2017 was launched earlier this year, I wrote an article to provide a glimpse of how to get started with Office 365 development with VS 2017 and different project templates available in VS 2017. You can read it here. Let’s continue our journey of Office 365 development with VS 2017 in this article. In this article, we will walk through creating and running Office 365 projects in VS 2017. Along with that, I will explain Office 365 Add-in concepts side by side. We will learn the following in this article. This article assumes that you already have installed Visual Studio 2017 with Office 365 development option on your PC. If not, then please read part-1 and follow the installation steps. 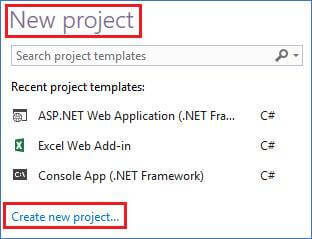 You will not see the project templates mentioned in this article if you don’t have the correct version of Visual Studio with Office 365 development option. 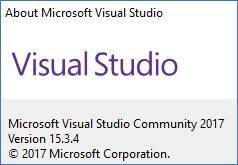 To make sure which version of Visual Studio you are using, go to “Help” menu and select “About Microsoft Visual Studio” sub-menu in Visual Studio. Make sure you are using Visual Studio 2017. I’m using Community edition of VS 2017 which is “Free, fully-featured IDE for students, open-source and individual developers”. You can download VS 2017 Community edition here. The Office 365 development options are same in all editions of VS 2017, namely Community, Professional, and Enterprise. So, it will not matter whichever edition of VS 2017 you have for following the steps of this article. Let’s start with creating a new Office 365 project for the add-in. 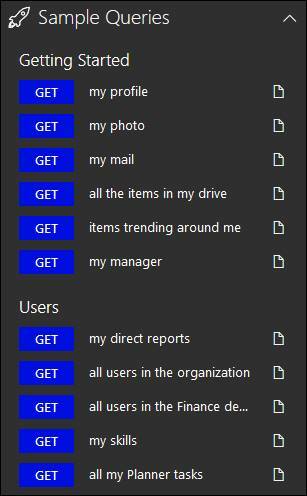 In the “New Project” popup, expand “Office/SharePoint” category under Visual C# and click on “Add-ins”. You will see project templates for Word, Excel, PowerPoint, Outlook, and SharePoint add-in. Let’s briefly understand about Office 365 add-ins. What is Office 365 add-in? 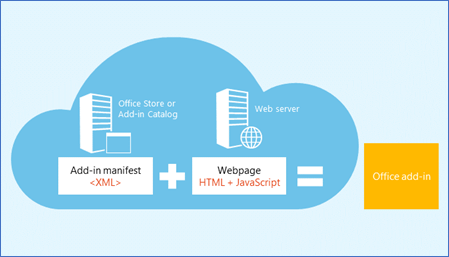 With Office 365 add-in or Office add-in, you can build program/solution that extends Office applications and interacts with the content in Office documents. You can add new functionality to Microsoft Office clients or create new rich, interactive objects that can be embedded in Microsoft Office documents. Office add-in runs in Microsoft Office across multiple platforms, including Office for Windows, Office Online, Office for the Mac, and Office for the iPad. 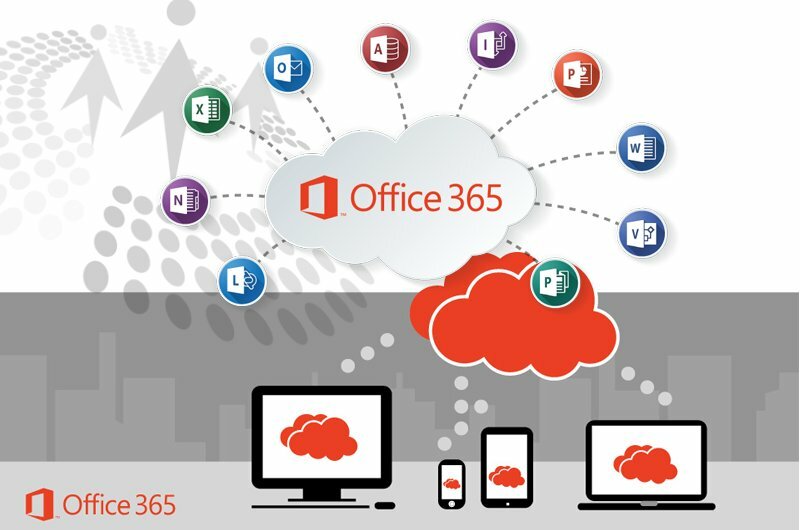 For more information on Office 365 add-ins, read on Microsoft website here. I will cover more on Office 365 add-ins in a separate article later. In the New Project popup, select “Excel Web Add-in”, then click OK.
Add new functionalities to Excel. Insert content into Excel spreadsheets. Let’s quickly see what this means. We will understand by inserting some add-in in Excel. “Office Add-ins” dialog will open. Click on “STORE”, enter “Wikipedia” in search, once Wikipedia add-in appears, click on “Add” button next to it. The dialog box will close and you will see now that the “Wikipedia” add-in is added under “Add-ins” ribbon. Click on it and on the right side, you will see a new section. 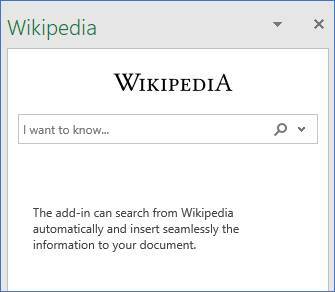 Anything you can do on Wikipedia website, now you can do from inside Excel only using this add-in. This is an example of “Extend functionality” type of add-in. These types of add-ins let you do some work right from Office applications without opening any other application. 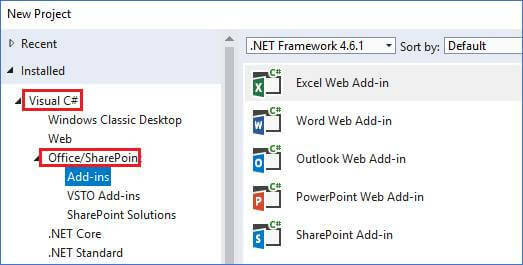 If you want to create this type of add-in, you should select “Add new functionalities to Excel” option in “Create Office add-in” dialog. Click on the first row “Add” button. You will see in the top right under “Insert” ribbon, a new “Excel Bubbles” add-in is available now. 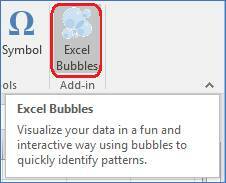 Click on it and a section with bubbles is added into current worksheet. This is an example of “Content” type of add-in which adds some content inside an Office application. 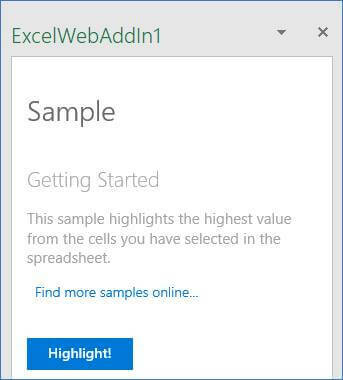 If you want to create this type of add-in then you should select “Insert content into Excel spreadsheets” option in “Create Office add-in” dialog. Let the selection be “Add new functionalities to Excel”. Click “Finish”. Before understanding “what” these projects are and “why” they are created, let’s first understand the composition of an Office 365 add-in. Let’s now run the project to see it working. Press F5, VS will build the solution and launch Excel to make your add-in available inside it. 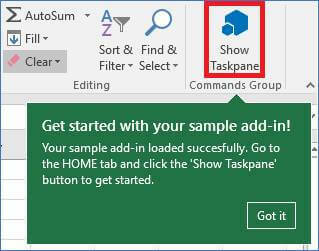 Click on the “Show Taskpane” button. 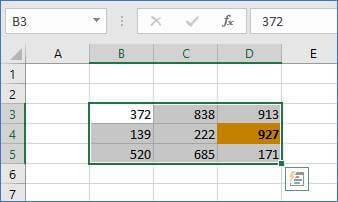 The task pane area will be loaded on the right side of Excel worksheet. 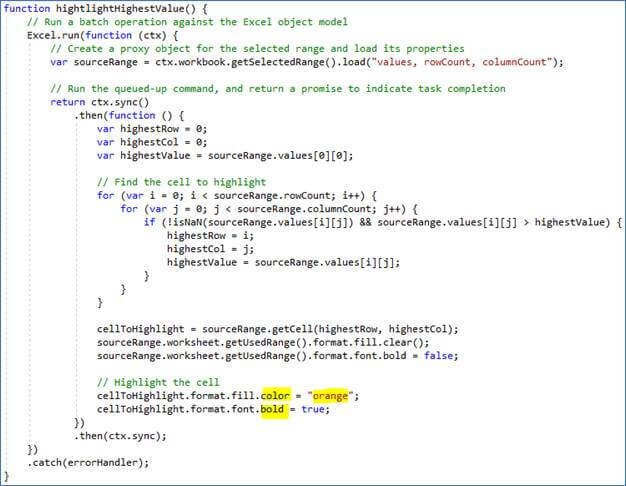 The JS code will get executed and highest value cell among the selected cells will be highlighted. Stop the running project from Visual Studio and let’s now see the code which made it work. 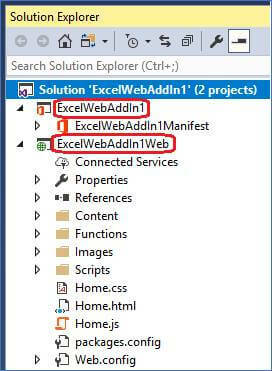 In the Solution Explorer, double click the “Home.html” file. 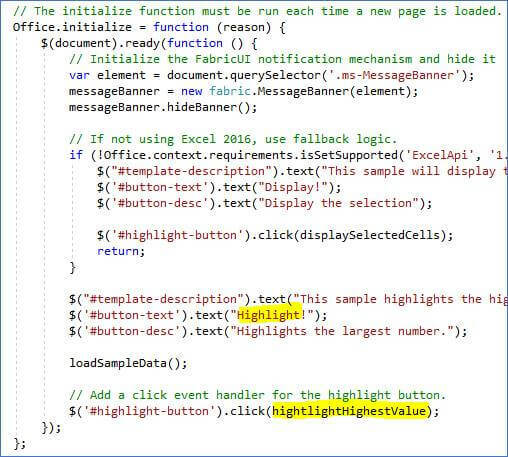 In the Solution Explorer, double click on home.js file. This is the file which contains all code to interact with Excel. It sets the button text to “Highlight” and also sets the JS function which should be executed when someone clicks on it, among other things. 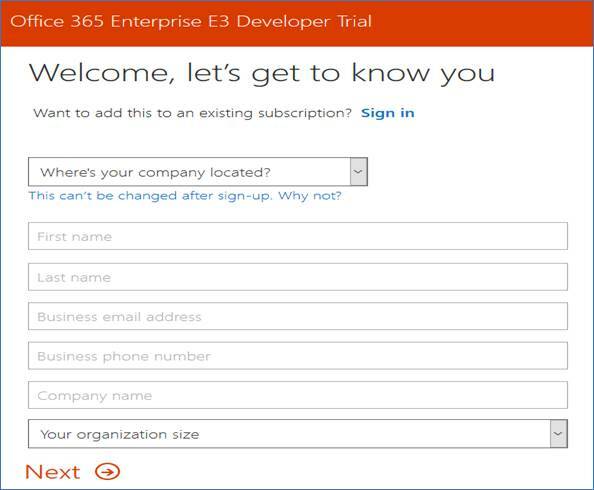 See how simple it is to get started with Office 365 add-in development? You must give it a try yourself using VS 2017. The purpose of this article was to make developers aware of Office 365 add-in development using VS 2017 which I have done above. You have to come up with the idea of your add-in to create a real-life Office 365 add-in which adds some value to the Office clients. That’s it for this article. I will cover more add-in options in next article. Recently I wrote an article about how you can consume MS Graph API in Power BI (read it here). MS Excel can also consume Microsoft Graph API in the same way. In this article, I will show how you can quickly fetch Office 365 data of your organization in MS Excel using Microsoft Graph API. We will fetch an organization’s users list in MS Excel with MS Graph. 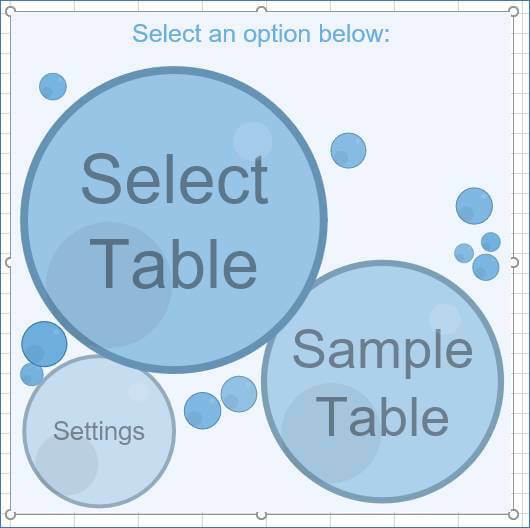 Once you learn to use MS Graph API in MS Excel, you can explore more options by yourself. To make this article easy to follow, let’s identify a real-world requirement and then see how we are going to solve it using MS Graph API and Excel. Suppose you are working in the IT department of an organization who employs 500+ users. On weekly basis, new employees join your organization and some leave too. The receptionist needs up-to-date information about all employees and their contact details. You are asked to provide her a simple solution. You create an Excel workbook for her using MS Graph API data feed which will show list of employees which she can refresh anytime to get latest updates. 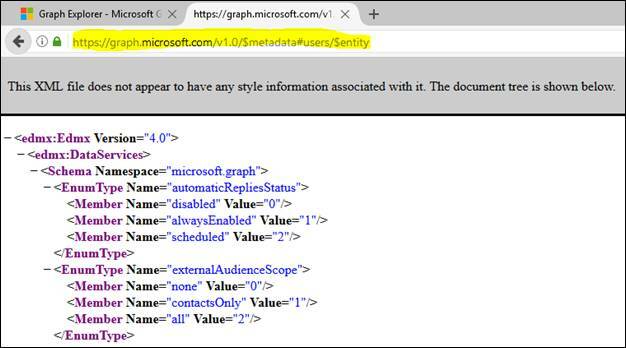 What is MS Graph API? There is no coding involved to follow steps of this article. However, if you want to follow along the steps, then it’s better to have Office 365 developer account as mentioned in “Prerequisite” section below. You may have access to Office 365 thru your employer/organization account. However, it is strongly advised that you don’t use your live/organization account to follow steps of this article. Instead, use Office 365 developer account. Use your live/organization account only when working in a production environment. Read my blog on how to get Office 365 developer account for 1 year free here. I assume you have Office 365 developer account and you also have MS Excel installed on your PC. Open MS Excel and create new workbook. Why we choose this option? 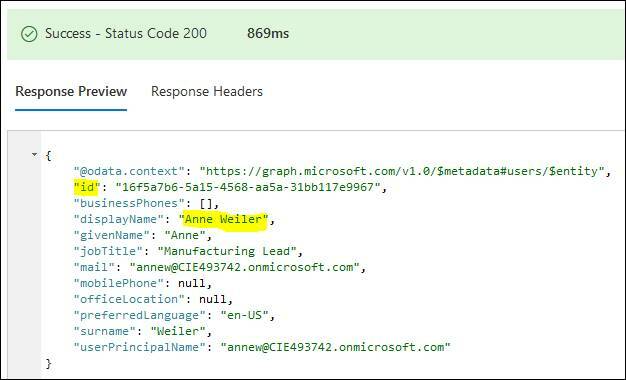 MS Graph API is based on open web standards and it supports OData V4, and MS Graph API accepts and returns data in JSON format, making it easy to integrate with other applications and technologies. We want to access all the users of an organization. The MS Graph API endpoint https://graph.microsoft.com/v1.0/users returns all users of an organization. Don’t use your organization/live account to sign in. Use your Office 365 developer account to sign in. Click on Connect button to continue. 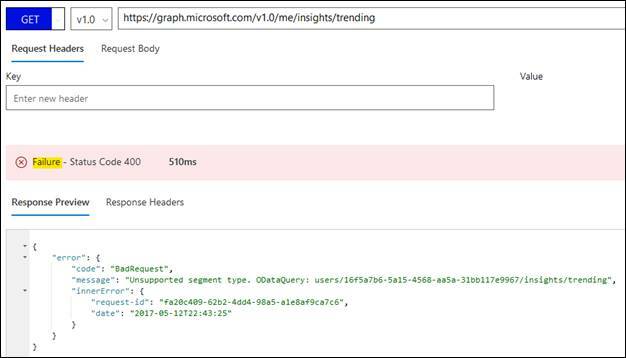 It may take some time to fetch the result from MS Graph API call depending your internet connection, but it will not be more than a few seconds. Once MS Excel fetches the users using MS Graph API, it will show you result in a dialog. For demo, I have created some users in Office 365 Admin Portal using my developer account. I suggest you also create some demo users with your Office 365 developer account using Office 365 Admin Portal. This dialog has options for how you want to view the data and where you want to place the data. You can import the data to new worksheet too. We will not do anything special in this dialog, I just wanted to show you the options available in Excel. MS Excel has received the JSON data result from MS Graph API in response to the call to https://graph.microsoft.com/v1.0/users endpoint, and converted it to a data table for you. What you see here is the list of all properties it got from MS Graph API. By default, Excel will load all the columns it received from MS Graph API, some columns will not have data and you will not want to display all the columns. We will see in some time how you can choose only some columns to be displayed. Click on “Close & Load” button on top left to continue. Good job! You got your organization’s data in Excel using MS Graph API. How simple it was! Now, let’s come back to the receptionist’s requirement I mentioned at the start of the article. A new employee has just joined office. She needs his details in this Excel too. What should she do? For the demo to work, I have opened Office 365 Admin Portal and added a new user named “Graph Explorer” to my organization using Office 365 developer account. I suggest you also add a new demo user to your developer account using “Office 365 Admin Portal” -> “Add a user” link. Do you see the user “Graph Explorer” now in the first row? So, the reception’s requirement is fulfilled. Every time she wants latest data, she has to just hit “refresh” and MS Graph API will do the rest. 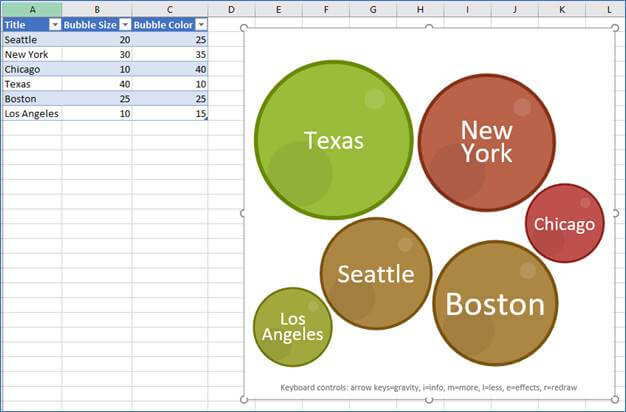 The purpose of this article was only to show you how MS Graph API data can be consumed in MS Excel, which I have shown above. Similarly, you can try by yourself calling some other MS Graph API endpoints. Meanwhile, if you want to read more of my articles on MS Graph API, please visit https://nilesh.live/blogs/msgraph/. Note: All my blogs on Microsoft Graph API can be found here. In first two parts of my article series “A First Look at the New Microsoft Graph Explorer”, I explained about different components of Microsoft Graph Explorer. I suggest you to read those two parts first, before reading this third part for better understanding. I will continue the article series with part three where I will explain how to execute the calls to Microsoft Graph API. 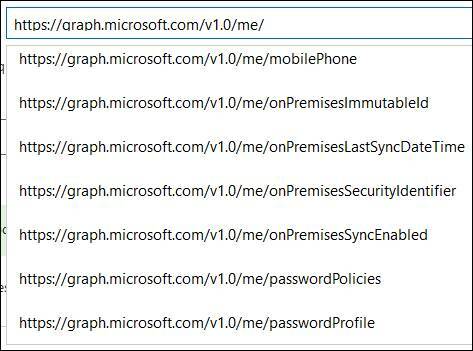 Let’s look at some simple GET calls to Microsoft Graph API using the Graph Explorer. Open the Microsoft Graph Explorer by clicking here. Check the left section under “Authentication”. It says currently a sample account provided by Microsoft with some test data is being used. You can fire GET calls using this account right away. API endpoint for getting user’s profile is already loaded. Simply click on “Run Query” button to execute the API call. You will see that the response area of the page is updated with something, like below. The status in the green background indicates that the call was successful with HTTP status code of 200 and executed in 869 mill seconds. Look at the JSON data in “Response Preview” section. It has some data of “user” which is the current user provided by Microsoft sample account. If you are logged in with your account, then you will see your data. I will cover the calls after login with your account later. There is also something more. You might be wondering how to find out what data to expect in an API GET call response or what data to pass in an API call POST request. You can read the Graph API documentation or look at the sample queries on left side section, but there is also another way. You will see a URL for “@odata.context” property. Copy the URL and paste in a new tab. You will see it loads an XML file. A big XML file. That’s the OData documentation of the Microsoft Graph API. 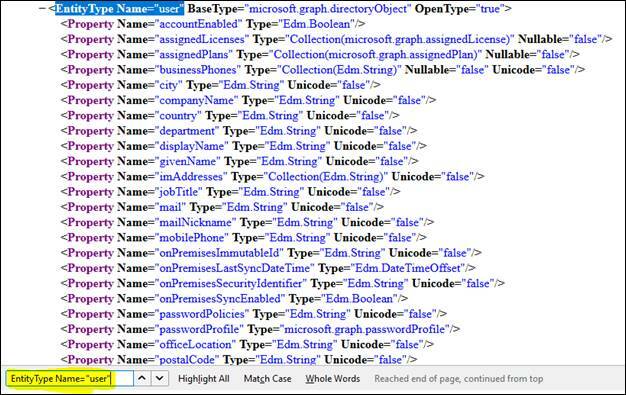 Microsoft Graph API metadata in other words. It specifies the different entities and actions along with properties and parameters. Search for the following in the page- EntityType Name=”user”. 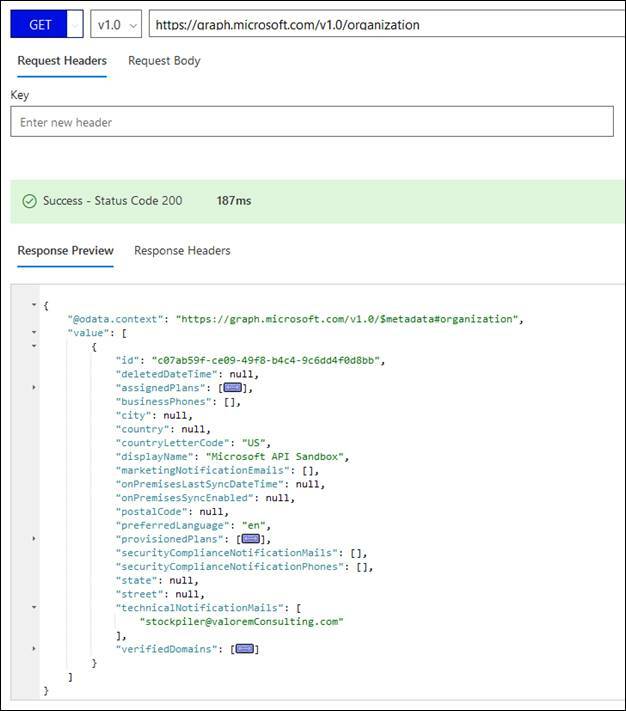 “The metadata allows you to see and understand the Microsoft Graph data model, including the entity types, complex types, and Enums that make up the resources represented in the request and response packets. 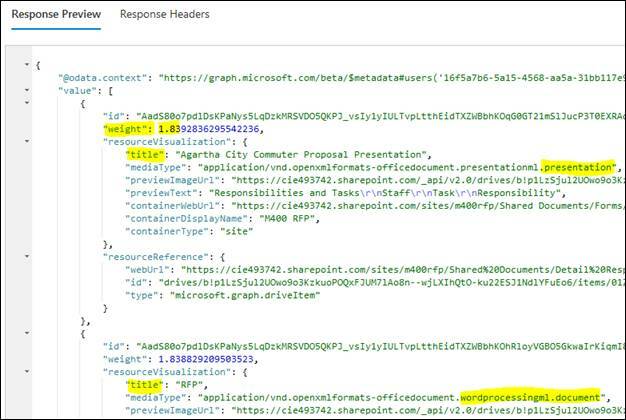 You can use the metadata to understand the relationships between entities in Microsoft Graph and establish URLs that navigate between those entities. For the scope of this article, I will not go deeper inside this XML file and will leave it to you to explore more. Please note that in Microsoft Graph API “me” and “organization” are the only two aliases in Microsoft Graph API i.e. these two are not the actual objects in Office 365. If you want to test more GET calls, then you can see list of some GET calls in left section under “Sample Queries”. Now, let’s see how to call some Graph API endpoints which are still in preview i.e. in beta. You will see the names of some documents are returned with their “weight”. These are the “trending” documents around the user and you need to write some code to convert the “weight” of each document to some meaningful representation to end user. But the purpose of making this call is to make you understand how to fire a beta API call in Microsoft Graph Explorer. You will see it returns an error, because this endpoint is only in beta version and not yet in V1.0. 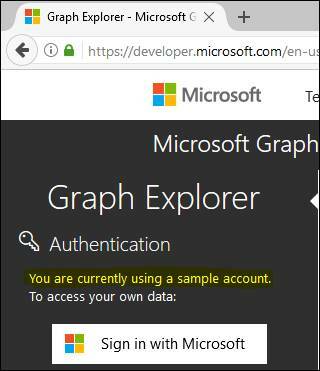 I hope you will play with Microsoft Graph Explorer and fire some more GET calls until I write the next article and we continue the journey of learning with the new Microsoft Graph Explorer. Note: This article was first published by me on C# Corner website here. 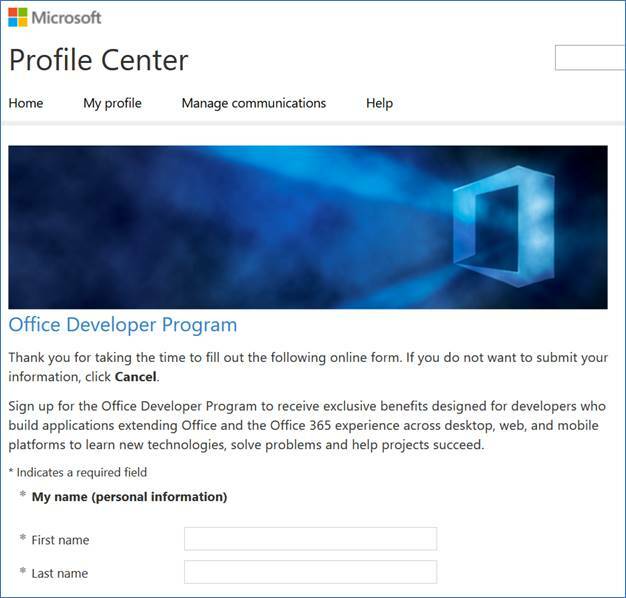 In this article, I will introduce you to MS Office 365 Developer program. The user base of MS Office 365 is increasing day by day by leaps and bounds. Microsoft needs to prepare more and more developers who work with Office 365. 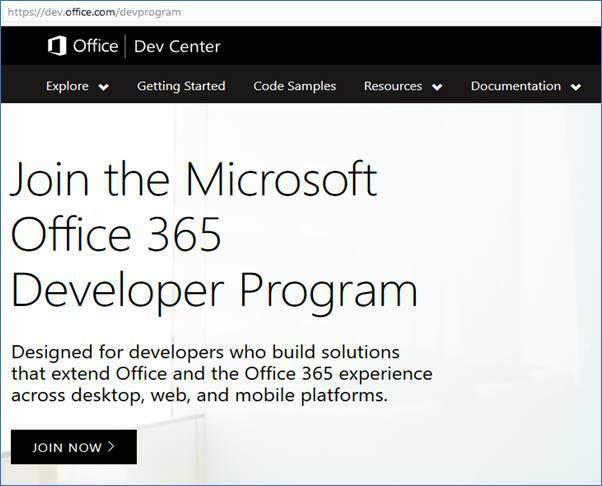 For this reason, Microsoft has designed the MS Office 365 Developer Program for the developers who build Office 365 solutions across desktop, web, and mobile platforms. You can start registering for the developer program by clicking on “Join Now” button. 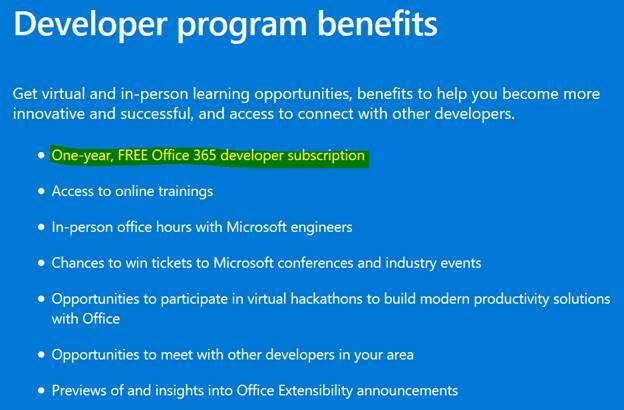 What are the benefits of MS Office 365 developer program? The program offers many benefits. The most interesting one is one year free Office 365 developer subscription. You can also access some free online training on Office 365 too. If you register now and till next few days, you will also get a chance to participate in a draw to win MS Ignite 2017 event. If you want to start with Office 365 development which is very much in demand now, then you will need a demo or test account for your programming. You may have access to Office 365 via your employer organization but that is the live organization data. You may not want to play with live data while you are in the testing and training phase of some new programming. Microsoft is giving you a free one year subscription which you should not miss. 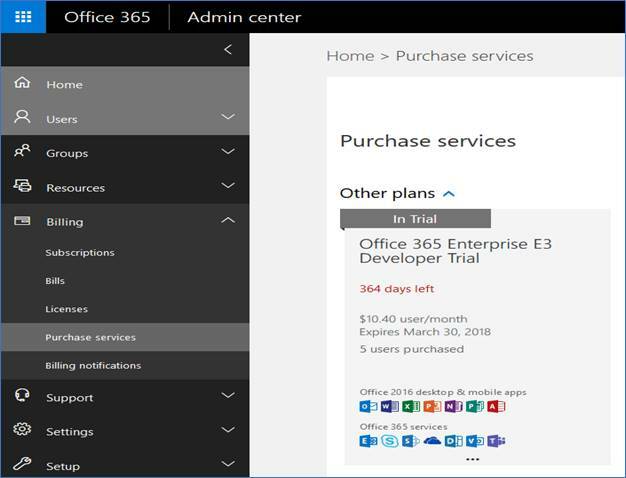 Among other things described in one of the screenshots above, you will get “Office 365 Enterprise E3 Developer Trial” subscription with 5 users and US $10.40 user/month credit. 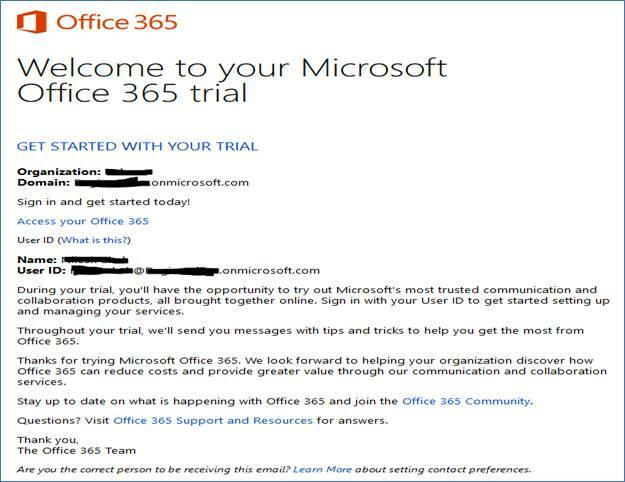 Note: Shown above is a screenshot of my developer trial subscription from Office 365 Admin portal. 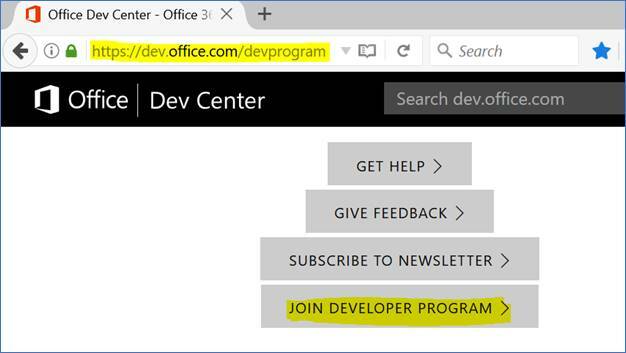 You can either click on “Join Now” button as shown in first screen or scroll down on the dev program home page and click on the “Join Developer Program >” button. Once you click on the “Join” button, you will be shown a registration page. Fill in your details and continue. Once you have completed the registration, you will get an email from Office Developer account. 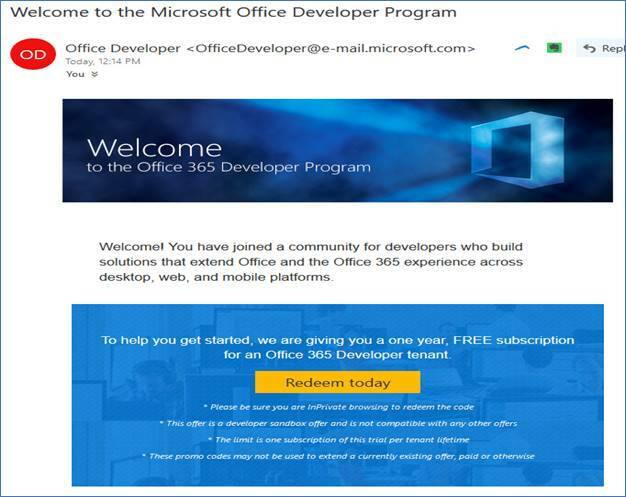 This email has a link to redeem your free Office 365 developer account. Click on the “Redeem today” link in the email to continue. You will be shown the following screen. You will see the following confirmation page. Please keep note of your user id which ends with “.onmicrosoft.com” which you will use to login to Office 365. Once you have everything setup, you can visit the Office365 portal to access your account here. Note: The above shown image is my office 365 portal landing page. You can start using the Office 365 products right away. 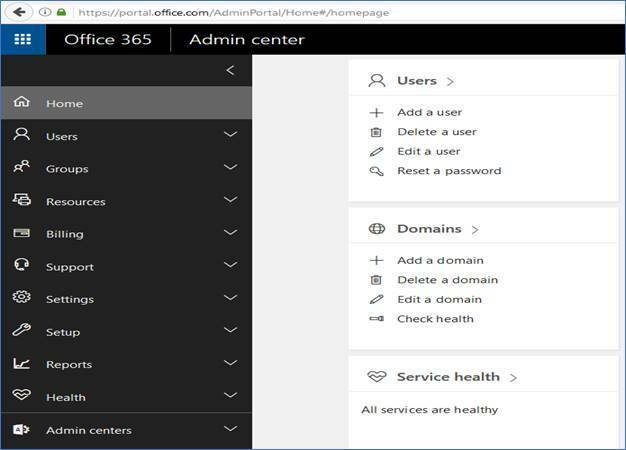 You can visit the Office 365 admin portal here. You can manage users, groups, etc. from the Office 365 admin portal. Finally, go to the billing section and check your subscription. It will show you how many number of days are left. Go now and create an Office 365 developer account, create some test data, and start programming with Office 365.